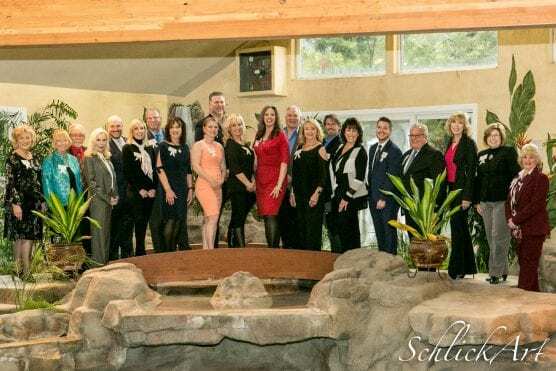 Shutters clicked and lightbulbs flashed as the nominees for 2019 SCV Man and Woman of the Year were announced Wednesday at the annual “Paparazzi Party” at the Sand Canyon estate home of Wayne and Dianne Crawford. A total of 22 nonprofits nominated nine men and 13 women for the 2019 awards, the winners of which will be announced at a gala dinner Friday, May 3, at 6 p.m., at the Hyatt Valencia Regency. Reigning Man of the Year Nick Lentini and Woman of the Year Gloria Mercado-Fortine introduced representatives of the nominating organizations who each gave a brief speech on the merits of their nominees. Joyce Carson, 2001 Woman of the Year, served as “timekeeper” to make sure the speakers didn’t exceed their allotted time limit. The Henry Mayo Newhall Hospital Foundation, represented by Marlee Lauffer, nominated Dale Donohoe and Mitzi Like. Donohoe, who was unable to attend the event, was described by Lauffer as “being synonymous with nonprofit generosity in the Santa Clarita Valley.” Like, said Lauffer, is one of Henry Mayo Hospital Foundation’s top supporters. Nick Lentini and Gloria Mercado-Fortine, SCV Man and Woman of the Year for 2018, kick off the evening. Photos below: Michele E. Buttelman. “She has provided our staff with amazing advice,” she said. The College of the Canyons Foundation nominated Steve Corn and Doreen Shine. Taylor Kellstrom was nominated by a trio of nonprofits: Children’s Hospital Los Angeles, Circle of Hope and JCI Santa Clarita. “Taylor Kellstrom takes his role and commitment to Circle of Hope seriously,” said Pam Ripling, the organization’s executive director. JCI Santa Clarita also nominated Sharlene Duzick. Ed Masterson also earned the nods of three SCV nonprofits: Carousel Ranch, Child & Family Center and the WiSH Foundation. Carousel Ranch’s female nominee was Teresa Todd, while the Child & Family Center also nominated Sue Reynolds Buckley. SCV Senior Center Executive Director Kevin MacDonald introduces the organization’s male nominee, Brian Koegle. Attorney Hunt Braly was nominated by Bridge to Home and Homes4Families. Donna E. Deutchman, president of Homes4Families, praised Braly’s dedication to the veterans served by the organization. “Hunt Braly is the perennial builder of housing, of futures, of lives and of hope,” she said. Two nonprofits also nominated attorney Brian Koegle: HandsOn Santa Clarita and SCV Senior Center, while the Senior Center also nominated Julie Sturgeon. MacDonald said with all of the organizations that Sturgeon has supported, she has given a cumulative 75 years of service to the community. The Rotary Club of SCV nominated Glenn Terry and Tami Edwards, while Janine Jones was nominated by two organizations: American Cancer Society and SRD-Straightening Reins Foundation. Nominee Pam Ingram is introduced by Sebastian Velona Foundation co-founder Teri Fox. “Janine Jones is the definition of community service her commitment to helping her fellow man is enthusiastic and powerful,” said Teresa Kerr, representing the American Cancer Society. Laura Kirchoff also earned two nods, from Circle of Hope and Soroptimist International of Greater SCV. The Samuel Dixon Family Health Center nominated Alan Ferdman, and the SCV Sheriff’s Foundation nominated Ken Wiseman. Ann-Marie Bjorkman was nominated by the Boys and Girls Club of SCV. Pam Ingram was nominated by the Sebastian Velona Foundation. Darleen Lyons was nominated by Zonta Club of SCV, and Anna Riggs was nominated by OLPH Italian Catholic Club. The SCV Man and Woman of the Year Recognition honors men and women who have given outstanding volunteer service to the Santa Clarita Valley area. COC Foundation Development Director James Kneblik introduces nominee Steve Corn. Candidates must have provided individual volunteer services to a nonprofit community service organization and are judged on length, time commitment, type of service and impact of service to multiple local organizations. Mercado-Fortine began the evening with a short history of the SCV Man and Woman of the Year award. Mercado-Fortine said the honors are important to the SCV. For more information and to reserve seats at the gala dinner, visit https://scvmw.org. The real question is why should we care and did they truly deserve such an honor?